Universities work to ensure students have the tools to succeed — including food security. Envision college, and images of cashing checks from mom and dad, oversleeping, and late-night pizza and beer probably come to mind, perhaps along with a little studying. But a growing number of students in the United States don’t enjoy a carefree lifestyle. Riccardo Prudenti has been working on a master’s degree in landscape architecture at Kansas State University, but despite creating an austere budget for himself, he has wound up with $25 a month to buy food. “It was scary for me to think when I pay my gas and utilities and rent — where is room for food, let alone healthy food?” He lost his mother, who had provided a support system, and has struggled with anxiety. 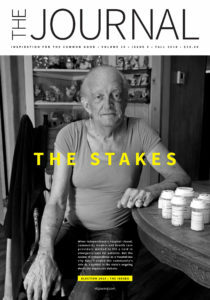 “It’s hard to operate when you feel bad about yourself,” he recalls. Courtney Mills, too, has struggled to complete a degree at K-State. Mills was placed in foster care at age 12. Her path was rocky, involving the death of a beloved foster mom, molestation by a trusted male father figure and being kicked out of her adopted home when she became pregnant. Years later, she is in school and working to earn a bachelor’s in kinesiology, but her student loans aren’t enough to support her and her daughter. When income from a part-time job became spotty, she felt stuck. “I didn’t know how I would pay bills and do everything,” she says. A survey released in April 2018 found that 36 percent of students at 66 colleges and universities don’t get enough to eat. Those numbers made national news. Here in Kansas, university officials probably weren’t surprised: Every state university governed by the Board of Regents already has a food pantry to help students like Prudenti and Mills. At K-State, the pantry is called Cats’ Cupboard. After a survey of undergraduate students found that 14 percent of respondents couldn’t meet basic needs, 47 percent had been unable to buy groceries at least once, and 25 percent had skipped meals, K-State Student Life officials realized students needed additional resources. Sarah Barrett was instrumental in establishing Cats’ Cupboard. She recalls reading the survey data and characterizes it as eye-opening. “We asked about what students were engaged in such as adding hours to their job or selling books back, but students indicated they were willing to engage in unhealthy behaviors. It was not just anonymous data from a (Washington) Post story — it was students we see every day,” she says. Cats’ Cupboard opened in September 2017 and has been visited more than 2,280 times by 502 unique users. It’s staffed 30 hours a week by one professional staff member and a dozen student volunteers, and it is heavily supported by donations from the campus and community. The pantry allows students to enter and “shop” just as they would in a store. They take what they need, including laundry and personal care items and even household goods to assist in preparing food. Barrett knows the importance of allowing students to have agency. “I grew up in a family with six children and a single mom. We often utilized commodities or a food pantry. We want students to feel dignity and respect and feel their needs are being met without social stigma,” she says. Erin Bishop, Cats’ Cupboard’s coordinator, says the pantry has had a positive impact. Of those who have used it, 67 percent responded to a survey and 98 percent of those indicated that the Cupboard helped decrease their stress. “Our goal is to be seen as a retention service. It’s like tutoring, where you go when you need support to continue your progress toward graduation,” she says. Bishop also meets one on one with students to help them identify other resources on campus that can help mitigate financial stress and ensure they are able to complete their degrees. That kind of support is more necessary than ever. Educational attainment is greater than it has ever been in Kansas, with 90.3 percent of residents 25 and older with a high school diploma or higher, according to the U.S. Census Bureau. Those who hold a bachelor’s degree or higher make up 31.6 percent of the population. But many state officials believe that the long-term success of the state’s economy depends on significantly increasing the number of Kansans with something more than a high school diploma, be it a bachelor’s degree, associate degree or other postsecondary certificate. A 2013 study by the Georgetown University Center on Education and the Workforce estimated that as many as two-thirds of jobs will require more than a high school education by 2020. Only 39.7 percent of Kansans reach that threshold now. And it’s particularly important to increase achievement levels among the state’s young and growing Hispanic population. Right now, fewer than 12 percent of Hispanics age 25 and older have a college education. Although graduation and retention rates are increasing, system wide enrollment in Regents institutions decreased from 249,976 in 2015 to 243,719 in 2017. In May, the Regents announced the Get AHEAD – Adult Higher Education Accessible Degrees – initiative to help 300,000 Kansas adults who have college credits attain a degree. Experts agree that those with a college degree have higher lifetime earnings, plus other desirable outcomes, such as better overall health and lower disability rates. But those benefits pale in comparison with the benefits to society. According to a study by Philip Trostel, professor of economics at the University of Maine, individuals with more education pay more in taxes, thereby financing public services; require much less public assistance and social insurance, including workers’ compensation and unemployment insurance; are much more involved in their communities; and give more money to charity. States and regions benefit from the “productivity spillover” of an educated citizenry. With a passion borne of hunger, Sarah Barrett, Kansas State University’s Clery Act federal compliance coordinator, helped turn Cats’ Cupboard from a concept into reality. Since September 2017, the food pantry has been visited more than 2,280 times by 502 individual users. Mills credits Cats’ Cupboard with giving her opportunities to grow. She has developed leadership skills by representing students on the advisory board. “I don’t hold anything back on the board, because those impoverished, broke, struggling students: that’s who I represent.” The confidence she gained from her experience helped her apply for a new part-time job as a substitute teacher at the local Job Corps program, where she likes helping underprivileged kids have opportunities to learn a trade “so they can do something with their lives.” She wants them to feel like she does as she works to attain her goals. “I’ve never felt more empowered in my life than when going to college! It’s propelling me into my future,” Mills says. Yet perceptions about the benefits of college increasingly diverge along partisan lines in the U.S. A 2017 Pew Research Center survey showed that while a majority of the public says colleges and universities have a positive effect on the country, Republicans have increasingly negative views. While advocates see postsecondary education as empowering people and providing societal benefits, large swaths of the country have become increasingly skeptical. Reconciling that debate remains a challenge as college tuition costs continue to grow. In the meantime, more students, particularly first-generation college students from low-income families, will face additional financial barriers. Higher-education leaders contend that they are holding down requested increases – at K-State, this year’s increase is 1.1 percent – and cutting budgets, but critics still scrutinize the system’s spending decisions, such as six-figure contracts to keep former presidents on as advisers at some instititutions. Although the Kansas Legislature restored $15 million to higher education this year – half of the $30 million cut from two years ago – it’s fair to say that K-12 education funding is the issue that has consumed Topeka in recent years, and ongoing adequacy debates will result from June’s Kansas Supreme Court decision. 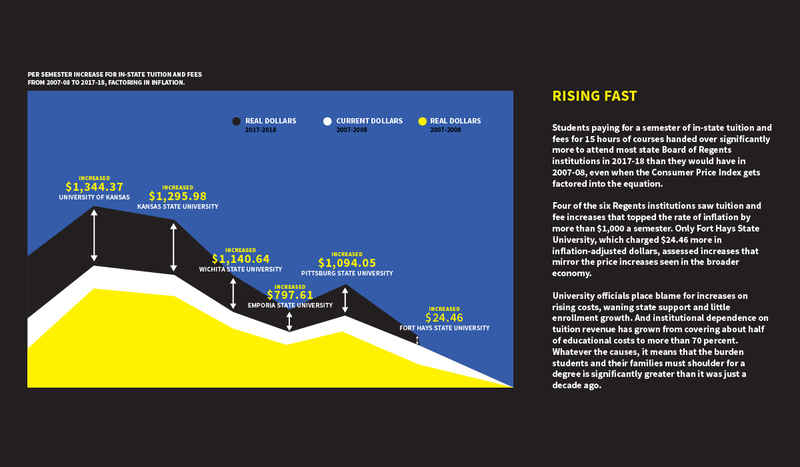 Meanwhile, higher ed struggles to contain costs while meeting student needs and competing in a marketplace that rewards top-flight services and facilities, all while coming to terms with nationwide long-range demographic trends that show fewer students in the pipeline. State government and higher education share the goal of bolstering the economic health of our state. Mills and Prudenti, plus thousands of other students and prospective students who are deciding whether they can afford higher education, will be watching closely. Will their decisions support long-term success in Kansas? This entry was posted in Higher Education and tagged educational attainment, tuition. Bookmark the permalink.